Preface by S. Harvey. 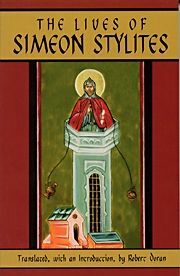 In the flood of Christian ascetics who withdrew from late antique society to seek God alone, Simeon, a fifth century ascetic, chose a novel escape. He mounted a pillar. There he remained for the rest of his life. Whole villages sent delegations for advice to Simeon for all kinds of problems: personal anguish, sickness, pain, infertility, personal sin, social injustice, etc. Included are the three extant lives of St. Simeon each viewing the ascetic from a different perspective.